Black Christmas is not a soap full of jovial laughter and merry wishes. It is not tinsel, mulled cider and sweet baked goods. It is the still, miserably cold winter night. Desperate, horrified and vulnerable: your sleigh stuck in an embankment, hungry prowling wolves catch the scent of your fear. A low growl issued from a distance not far away sends you scrambling for cover, yet you can never hope to out run them and survive. Primarily scented with bayberry and spruce, Virginia cedarwood is not far behind and clove lies in wait in the background. A few drops of orange are added to the blend, but not readily detectable, like a stalker in the shadows. This soap is for the strong, brazen and wholly fearless individual. The meek and timid should remain hidden under the covers. Infused with pure black activated charcoal and crimson glitter. Smells very similar to my Bayberry soap, though a little darker. You know... I really like the second verse of the poem (song, I know!)! I hope I can get some of this action this year! 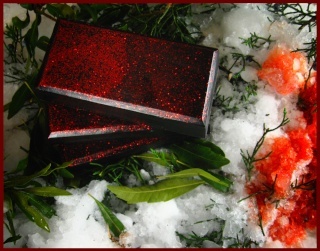 Such a beautiful soap; I love the black color, with the red glitter on top! I think this will be wonderful when paired with the Cedar & Siberian Fir salts. It smells very similar to LUSH's Greenwash soap from a few years ago. I don't detect a clove note right now, but perhaps that will come out in use. Lovely! I cannot begin to express just how much I love this soap!! The scent when dry (and still wrapped) is a gorgeous blend of bayberry, spruce and cedar... very Christmas-y! But, when I used a piece I sliced off... Clove came up and was all like, "Hi there. Remember me? Just hangin' here in the background. I'll be here if you need me." I'm glad this is a recurring Item! If I could give this soap 10 stars, I would! I've been anticipating this soap for a while now, since I found Solstice Scents last year after Christmas and this soap was long gone. Angela often told me that she thought I would really like this soap. O.M.G., it's GLORIOUS! As Angela said, it does remind one of her Bayberry scent, but then again, it's much more complex. The soap is a BEAUTIFUL black color with red glitter. It's very atypical for a holiday soap and I think that's part of the attraction. With all the colors of red and green for the season, flashing colored lights... it's nice to see a DARK Christmas soap. The story that goes along with this soap is wonderful... just another ingenious thing Angela adds to her products. How can one go wrong with the combination of bayberry, spruce, cedarwood, clove and orange! This is the ultimate Christmas scent. While you smell the Christmas tree, you also smell the spice of the bayberry along with a little hint of those orange pomanders we all used to make as kids... taking an orange and covering it with cloves. I can't say enough about this soap and it appears to be quite popular as Angela sells out of it every time she restocks it. I hope this one continues to come out year after year. I would LOVE to have this in a perfume or bath salts! My husband & I love this soap. The bayberry mixes with the other notes beautifully without being overpowered. Would love to have a bar of this every Holiday season.